Wilderness State Park in Emmet County may have cabins for rent, a boat launch, two campgrounds and a day-use area on Lake Michigan, but for most visitors the outstanding feature is its undeveloped nature. 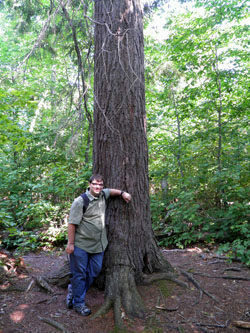 The 10,500-acre unit, the largest state park in the Lower Peninsula, contains more than 26 miles of shoreline, a dedicated natural area and a vast network of trails that attract those who want to photograph wild flowers, identify birds or spend a day hiking or mountain biking through its forested terrain of pines and hardwoods. 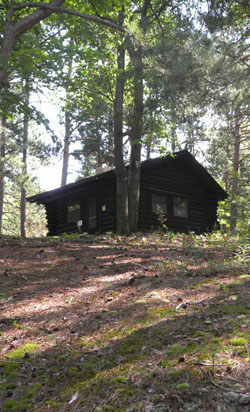 Michigan began acquiring the park in the early 1900s and in 1922 named it Emmet State Game Area before dedicating it Wilderness State Park in the mid-1930s. Although its outdoor center was used at one time by the U.S. Navy and later as a prison camp in the 1950s, the park itself has always remained undeveloped. Today Wilderness is the largest piece of contiguous, undeveloped land in the Lower Peninsula, featuring 5 miles of sandy beach along Sturgeon Bay and the islands and Waugoshance Point that separate the bay from the Straits of Mackinac. The point, a designated natural area, is an especially popular place for birders, as over 100 species either migrate through the area or nest here, including the rare piping plover. The park is also a haven for whitetail deer, black bear and beaver. In 1997, a Coast Guard pilot sighted a pair of wolves along the shoreline of the park after they had made the 5-mile trek across the frozen Straits of Mackinac. 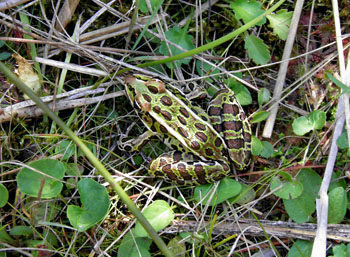 The pair eventually evolved into a permanent population in the Lower Peninsula. Winding across this vast park is a 38-mile network of trails with 11.4 miles designated as part of the North Country Trail (NCT), the national trail that winds from North Dakota to New York. Many of the trails are old forest roads that are closed to vehicles by locked gates. The main trailheads are along Wilderness Park Drive and include Old East Boundary, East Ridge, Nebo and Big Stone Creek Trails. 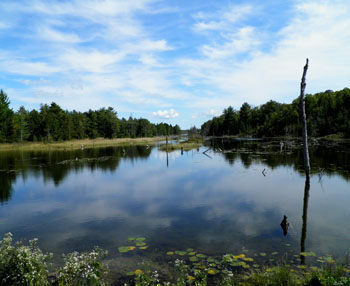 Goose Pond, near Pines Campground, is the trailhead for a number of short trails; Pondside Trail, Red Pine, the west end of Big Stone and Wilkenhs Trail, while nearby is the north end of the longer Swamp Line Road. The NCT enters the park from the east and merges into the East Ridge Trail. It then follows a portion of Nebo Trail, Old South Boundary Trail and Sturgeon Bay Trail before splitting off and continuing south along Sturgeon Bay. The NCT leaves Wilderness State Park at its southern most border. Developed trailheads for the NCT are at Lakeview Road and Sturgeon Bay Trail. Wilderness represents the largest trail system in Emmet County and hiking opportunities abound here. One of the most interest treks within the park is an 8.35-mile loop that combines Nebo, Old South Boundary, Swamp Line, Red Pine and Hemlock Trails. You can turn it into an overnight adventure by renting the classic Nebo Cabin. The best half-day hike is a 4-mile loop that begins at Goose Pond and combines Red Pine, Hemlock and Big Stone Trails with a portion of Nebo Trail and Wilderness Park Drive. Another popular hike is from the parking lot at the west end of Waugoshance Point Road to the end of the point, a one-way 2-mile trek along a pebbled and rocky shoreline. Check with DNR staff first, as parts of the shoreline are closed in spring and early summer when the endangered piping plover is nesting. A pair of walk-in campsites allow backpackers to enjoy the park as overnight treks. The most scenic is on O’Neal Lake and combining the O’Neal Lake Trail with portions of Nebo Trail, Sturgeon Bay Trail and Swamp Line Road makes for 13-mile loop with a night spent at the remote campsite. Trails that were originally two-tracks are open to mountain bikers for almost 11 miles of nontechnical riding in a wilderness-like setting. 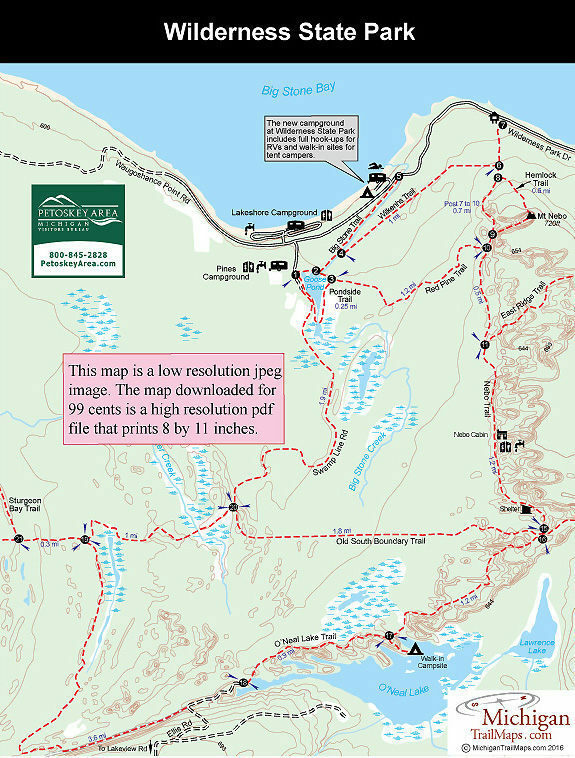 The longest loop would be an 8-mile ride that would combine Old East Boundary, Old South Boundary and Sturgeon Bay Trails with a portion of the park road, but keep in mind that several wet areas might be encountered. The driest loop would be the 6-mile ride of Nebo Trail, a portion of Old South Boundary Trail and Swamp Line Road. Mountain bikers are not allowed on Red Pine Trail, Big Stone Creek Trail, Hemlock Trail or portions of the North Country Trail. Skiers can enjoy 6 miles of groomed trails during the winter along a loop that follows Nebo Trail, a portion of the Old South Boundary Trail and Swamp Line for an easy ski with few hills to contend with. The cabins are also well used during the winter, and Nebo can be reached only after a 2-mile ski from the park road. The park has 278 modern sites divided among three campgrounds. The Lakeshore Campground is situated along Big Stone Bay in a semi-open area and among the 150 sites is a row right off the beach. Pines Campground is across Wilderness Park Drive and has 100 sites, most of them with paved pads and situated in a grove of mature pines. In 2016, the park open a new campground the outlet of Big Stone Creek that featured 18 full-hook sites for RVs and 10 walk-in sites for tent campers. Both campgrounds tend to be filled weekends from early July to mid-August but usually have sites available midweek throughout the summer. The exception is the last week of August through Labor Day when the park is filled daily due to the Mackinac Bridge Walk.